Google Cloud’s Annual Conference wrapped up yesterday (April 11, 2019). This year’s conference was especially interesting as it was the first time Google Cloud’s new CEO, Thomas Kurian, was behind the helm (no K8S pun intended). Google Cloud Code – a cool DevOps focused offering based on a collection of plug-ins for IDE tools like IntelliJ and Visual Studio Code (which is my favorite) which streamlines the process of writing an application, packing them and deploying them from the IDE tool. New AI focused solutions – Google Cloud has successfully established itself as the cloud vendor with the most mature AI/ML offerings, and Google added more solutions to help companies with limited resources, or knowledge gap needed, to leverage the power of AI. For example, they enhanced their ‘Contact Center AI’ solutions (still in beta) to allow automated and intuitive customer care experience. 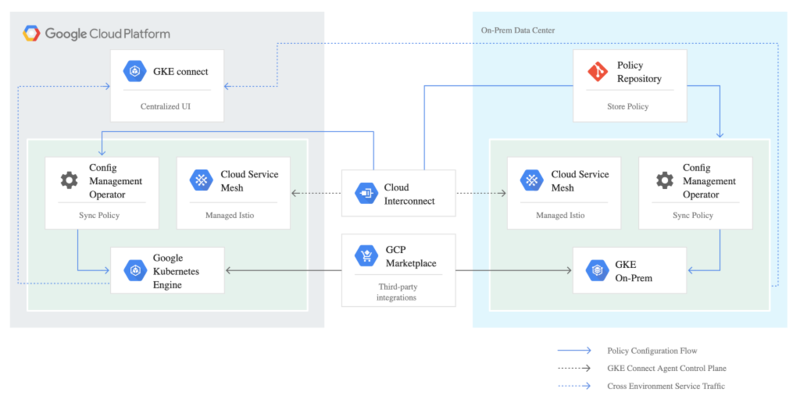 Google Cloud for Retail – not all retailers flocked to the cloud; some opt to build private clouds or leverage other vendors than Google. Google is making it clear that they are planning to tackle this vertical by offering services and solutions to attract new customers (primarily smaller retails) by providing easy to use, retail-targeted solutions based on AI, ML, and other Google services. Google Cloud Run - In this fully managed offering, Google is combining Serverless & containers into a service where the containers run as stateless, auto scalable HTTP service (I am oversimplifying this). Google said it attempts to address the challenges of the current offerings from AWS (Lambda) and Azure (Functions) where users are constrained by the languages and libraries they can use. Cloud Run is based on Knative. However, the one that received the most attention was Google Anthos which was announced by Thomas Kurian during the keynote. Many details shared during Anthos’ announcement, so here is a quick overview to help understand what it is all about. Anthos is a managed offering by Google which enables users to manage and deploy containerized applications to any Kubernetes-based environment. It provides a consistent experience no matter where the clusters reside, on-premises (with GKE On-Prem), or on the cloud. Google stated in its docs that: “[Anthos] provide management capabilities for creating, scaling, and upgrading conformant Kubernetes clusters.” – which means that CNCF’s Kubernetes certified distributions such as OpenShift are supported. Anthos aimed at containerized workloads running on Kubernetes; it is important to note that it does not manage VM based workloads. Anthos is a rebrand of ‘Cloud Service Platform’ (announced during 2018), but the most interesting element of this announcement is that Google is rolling out a multicloud offering. Anthos can be used to manage Kubernetes clusters on AWS (EKS) and Azure (AKS). No doubt this is quite rare, and it alights with the multicloud strategy adopted by many enterprises. In its current pricing model, the cost is $10,000 / month for 100 vCPU “Block” ($100 per vCPU of a managed workload wherever it runs) and requires a minimum of a one-year commitment. New subscriptions can be purchased in blocks of 100 vCPUs. Anthos is a clear statement by Google that Hybrid and Multicloud are becoming a top priority for every CIO. As companies adopt a multicloud strategy, they face multiple challenges, Anthos is focused primarily on addressing security and operations challenges when managing multi-k8s-clusters in different locations and vendors. However, Anthos does not address the critical challenge of how to assure the performance of the workloads running on kubernetes, either on-Prem, on GKE or any other cloud vendors. HOW DOES TURBONOMIC FIT IN? With Anthos, Google is trying to address both of these critical challenges, which will no doubt help with the adoption of a multicloud strategy. Turbonomic is an AI-Powered Workload Automation for multicloud environments. It allows enterprises to continuously optimize the performance, compliance, and cost of various container platforms, including Pivotal Cloud Foundry, anywhere. Google and other vendors will make the process of deploying containerized application a lot easier and automated (with DevOps integrations). However, the developers still need to apply “guestimates” to determine how much capacity the application will need to meet Service Level Objectives (SLOs) while being as efficient as possible - especially on multicloud where resources are billed by the second. These insights will help you navigate the Kubernetes ecosystem as you build for multicloud scale and elasticity.